Warner Bros and DC Comics have always had a dark relationship. Their action comic book films have been serious and very dark, including the upcoming Titans series which depicts Robin saying “F*ck Batman” after snapping a guy’s neck. Super dark. Fortunately, Warner Bros. Animation is entirely different and plays on the light side of the spectrum. Keeping its original format of silliness and humor, Teen Titans GO! to the Movies is a hilarious take on actual superhero movies and the characters behind it. Technically, you don’t need to be a fan of the Teen Titans GO! series, you just need to know some of the basic DC comic book characters. Newbies to the comic book world could also appreciate the film without having much knowledge of the characters, because the characters introduce themselves and their background in the first half the movie. 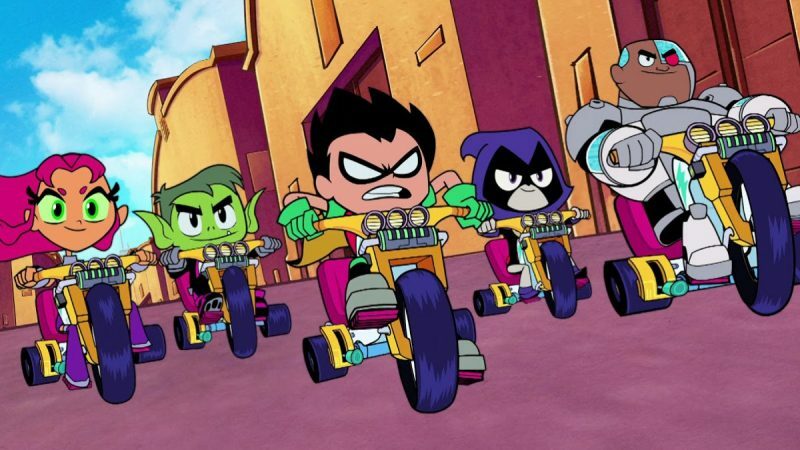 Very similar to Warner Bros animated series, Looney Tunes and Animaniacs, Teen Titans GO! 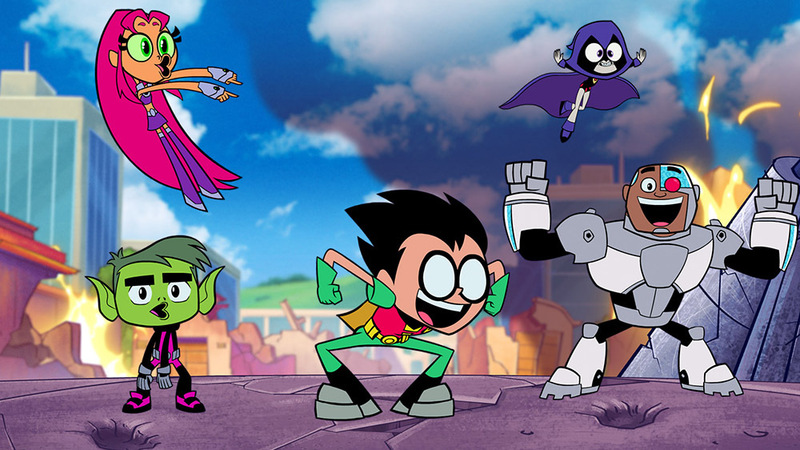 uses that sort of humor to tell the story of the Teen Titans – which consist of Robin (voiced by Scott Menville), Starfire (Hyden Walch), Beast Boy (Greg Cipes), Raven (Tara Strong) and Cyborg (Khary Payton) – as they go to Hollywood with dreams of making their own superhero movie. The Teen Titans are essentially considered jokes among the superheroes and are not given a superhero movie unless they find a worthy nemesis. The group focuses on the Deadpool of DC Comics – Slade aka Deathstroke (voiced by LEGO Batman’s Will Arnett). Deathstroke is able to outwit them using ‘mind tricks’, one that includes a pencil bending when moved quickly. After getting away, Robin and his team are able to convince movie director, Jade Wilson (Kristen Bell), to give them a movie, but only if the Teen Titans don’t do any silly hi-jinks. Well… everyone except Robin do embarrassing things, causing a wedge between Robin and his teammates. The movie does have a life lesson of unity and always believing in your friends and yourself. Kids will benefit from watching the friendship surrounding Teen Titans and laugh at the comedic cues. This film is also great for adults as there are so many Easter eggs within the jokes, including surprise cameos, Superman’s mustache, the mention of Green Lantern’s failed movie, and the most obscure superhero team – The Challengers of the Unknown. There is one part in the movie where the Teen Titans go back in time to change the origin stories of the major superheroes – they save Krypton from being destroyed; they steal Wonder Woman’s lasso as a kid; Robin drops a six-pack ring into the ocean for baby Aquaman to be stuck in; and, the Titans lead Thomas, Martha, and young Bruce Wayne on a different path. After realizing that life without superheroes destroyed society in the future, the Titans return to the past again and set things right – including humorously pushing Thomas and Martha Wayne to their demise. This may be Warner Bros Animations version of ‘dark’. It sounds dark, but it was actually pretty funny. It makes light of the entire situation. Overall, the film is one that both kids and parents would enjoy, especially if the parents do have an affinity to comic books or the DC Universe. I have to admit. I am a huge fan of Cartoon Network’s Teen Titans GO! since it started in 2013. It was about time we had a parody on the superhero genre and what better way to tell it than the superheroes we grew up reading. Plus, it’s great for kids. With Teen Titans GO! to the Movies, it was about time Warner Bros brought it to the big screen, which could potentially push other popular animated series into the film market. Teen Titans GO! to the Movies opens in theaters on Friday.